What lies behind of witchcraft? 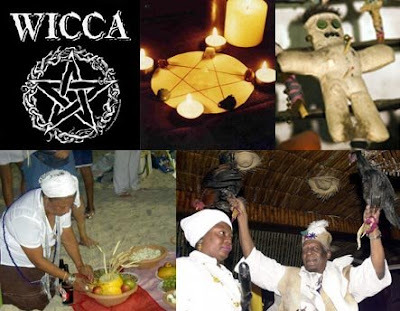 As a matter of fact witchcraft and witches “Wicca” do not exist because nobody has powers in the physical plane, evidently those who claim to have those “powers” are dealing with spirits of error, The whole issue was properly unveiled and it’s not a mystery anymore. Interlocutor: Aside from the spirits of error, “demons" and the ludic energies, Are there other negative entities that oppress or bother human beings? Ruanel: Yes, because it is necessary to include to the elementary of nature, as gnomes, elves, goblins, fauns, etc., but they don't do it by wickedness but by mischievous. Interlocutor: I already understand. And can they also make focus and produce images and all those things? Ruanel: Yes, they can make focus and produce images as well as the spirits of error. Interlocutor: And can they also become visible? Interlocutor: Many years ago, a friend of my father who was a mining engineer in Europe, told him that it was common that the miners saw gnomes appearing and warning them of the danger when there was some escape of gas. Is this possible? Ruanel: Of course, because many elementary beings are Servants. Interlocutor: Ah, I already understand... And with regard to the zombies, that is to say, the "living dead of Voodoo" that the sorcerers allegedly have at their service? This entry was posted at Sunday, July 26, 2009 and is filed under Mysteries and Enigmas . You can follow any responses to this entry through the .